The Marinski Affair began as a dull, mundane case involving a missing husband. Okay, so he was a rich missing husband, but he was nonetheless, still only a missing husband. The case soon developed into one involving robbery, kidnapping, blackmail, and murder. But was there really a kidnapping? And exactly who is blackmailing who? Who actually carried out the robbery? Who committed the murders? Who can you trust? Who can you believe? Is anyone actually telling the truth? What have they got to hide? And what connection was there with a jewel theft that occurred four years previously? All is not as it seems. Tom Kendall, private detective, had the task of solving the mystery. He was usually pretty good at solving puzzles, but this one was different, somehow. It wasn’t that he didn’t have any of the pieces. Oh no, he wasn’t short of clues. It was just that none of the pieces seemed to fit together. Although a standalone novel, it is also the second in a series featuring Tom Kendall, private detective. Would you try another book from John Holt and/or Kolyn Marshall? Yes................. they have talent but this book did not work for me,It was slow and the main character is a confusing mix of British and American. The plot twists showed promise but the characters lacked depth they did not seem real to me. He did the best he could with the material he had. Could you see The Marinski Affair being made into a movie or a TV series? Who should the stars be? A good detective story. Didn't read/listen to the first book but this book can stand alone. The story makes you feel like you are right there in the story. There are twists. A good read/listen. I have not read/listened to book one but I did not feel I was missing anything. This is a mystery book but we are told who don it, which I don't mind if the book is OK. I found that the detective went around in circles at times and kept repeating things. I found it dragged and I ending up putting the book down a few times. The story was not bad but the book needs editing. I liked the narrator, I thought he suited the book and he voiced all the characters. Our lovable, bumbling PI, Tom Kendall, is at it again. This time he has been hired to investigate the disappearance of the husband of one Eve Bradley. The real question...did Mr. Bradley disappear willingly? When Eve is murdered, Tom and his sidekick, umm, secretary, Mollie, must race against time to get to the bottom of the murder...and find the missing hubby. Another enjoyable whodunit in the case file of our favorite PI. Another great detective story from the author, I liked this better than the first in the series but only because I was already engaged with the main character. Both are great stories, this one grips you and keeps the chapters turning. Tom Kendall is dogged in his pursuit of the perpetrators, (slighly Colombo esque). Narration is excellent and audio quality is very good. Except Building of suspense ! It is a heart-pounding thriller, rich with detail that makes you feel you are right there in the story, and expertly paced to squeeze every bit of anticipation and dread out of the reader. I look forward to reading more by this talented author. Tom Kendall and his sidekick Mollie are both very good characters, and I found that this book was very easy to read and very hard to put down. If you like stories that keep you guessing, letting you think you know the answer until you realize you were being led up a blind alley, then this is the book for you. I loved this book! there were so many clues to put together! It was more like 3 cases they were trying to solve all at once! I loved the story and trying to figure out which trails were false leads and who was telling the truth! Definately a fun read! I would reccomend this book to all! Molly, I could kiss you. Tom Kendall is not quite the usual private eye of most novels. Oh, he's come up through the usual route, ten years a New York cop then nearly as long working for himself. But now he and his business partner fun secretary, Molly, have moved to Miami and just opened a new office. He could be fitter, needs to lose a bit of weight, but he really loves his chocolate biscuits. He doesn't need the money, he works because he wants to do so. He's good at asking questions, just not so fast at putting together the answers, whilst Molly, for all she is devoted to her celebrity magazines, often sees the bigger picture without even realizing it. 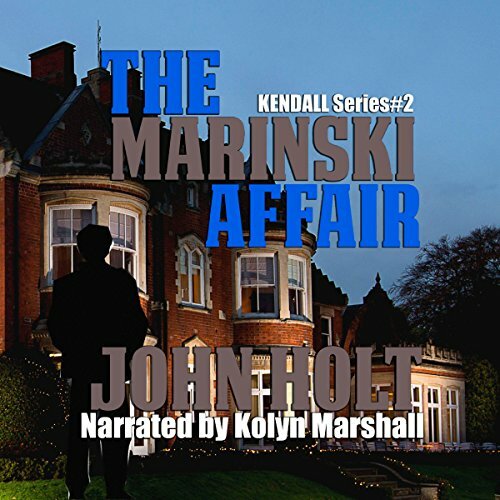 With Kendall and Molly, John Holt has created a really good character couple : Kendall asks the questions, doggedly determined and distrustful of all coincidence, whilst Molly makes the coffee and listens to his meandering summation of where his investigation has taken him so far. This is not a fast paced thriller but a delicious and meticulous piecing together of the puzzle, starting with an heiress whose husband has gone missing, believed kidnapped. Murder, robbery, lies and deceipt, and much downloading of rain along the way. Great fun. Narrator Kolyn Marshall makes an excellent Kendall, a slightly growly but sardonic tone capturing perfectly his personality. Voicing of the other characters is slight but easily sufficient, from the policeman friend Delaney through to Molly, although his Irish accent for a young woman named Mary really does need considerable work. There are also occasional editing glitches, mostly very slight, but including the final book credits briefly bursting into the final chapter. Overall, though, his was a good performance. I love these detective stories by John Holt. Completely character led, the reader can solve the mystery before the P.I. But that's all part of the enjoyment: the quirky personality of Kendall and our eavesdropping on his conversations with everyone he can connect to his case as well as those with marvellous Molly. I enjoyed the central character, perhaps a little of Lt Frank Columbo in him and the plot was good too. Nation was acceptable but the attempt at an Irish accent was poor. The book fell down on repetition, over explaining and inconsistences, all of which could and should have been edited out, sometimes less is more. The main character continually said he understood something in one paragraph and almost in the next, without extra information, that he didn't. With some pruning this could be an excellent crime novel.